A Lemon Grove, Calif., man who died Saturday morning after two deputies tased him multiple times has been identified by the San Diego County Sheriff’s Department as Mark Roshawn Adkins, 54. According to NBC San Diego, authorities were responding to calls that a black man was jumping fences and attempting to enter townhouses. “The callers also said the suspect was acting as if he were under the influence of drugs,” Sheriff’s Homicide Lt. Kenneth Nelson said. Two deputies, neither of whom has been identified, located Adkins in a patio area of the apartment complex, where authorities claim they repeatedly ordered him to get on the ground. It is not clear whether they saw Adkins running or just spotted him, a black man, in the complex’s patio area. When Adkins allegedly did not adhere to commands, both deputies deployed their Tasers, the San Diego Union-Tribune reports. Authorities claim that Adkins collapsed to the ground but immediately tried to stand up again, so deputies fired their Tasers again. Collette Adkins, Mark Adkins’ widow, had to be hospitalized after learning of her husband’s death. She also vehemently denies that her husband would try to break into people’s homes, and said that his mother lives right down the street from where the fatal encounter took place. Paul Brown, a resident who recorded the incident on his cellphone, told NBC San Diego that he heard Adkins tased at least three times. 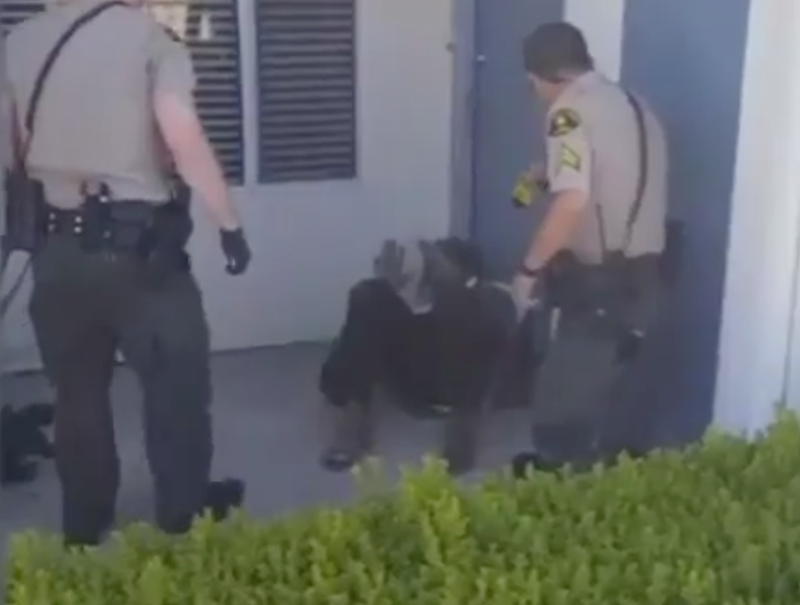 In the video Brown captured, which appears to begin after the first round of tasing, Adkins can be seen lying flat on his back with his hands up. At certain points, he appears to be struggling to protect his face and body from the threat that the deputies’ weapons pose. He also seems to fearfully jerk away when one deputy lunges for him—which should be an expected response from black people when one considers how often police officers get away with murder. It appears as if Adkins was trying not to die. .Almost immediately after the two deputies scream, “Roll over!” and “You will get tased again!” Adkins can be seen convulsing as the Taser’s barbs connect with his body. At that point, deputies were able to pin Adkins down and handcuff him. Medical personnel were called to the scene, but Adkins became unresponsive during treatment. He was taken to a local trauma center by ambulance, where he died a little before 12 p.m. PDT, approximately three-and-a-half hours after he was tased, the Tribune reports. The Tasers are being examined to see how many times they were fired and how many barbs connected with Adkins, Nelson said. Adkins reportedly was suffering with mental-health issues, but mental-health issues should not be punishable by death. “If a person is in a state of mind where they can’t comply, for [deputies] to electrocute them is not the answer,” Collette Adkins said. Mark Adkins’ official cause of death has not been released, pending autopsy and toxicology exams, but the incident is now under a use-of-force investigation. The Root will update this story as more details become available.